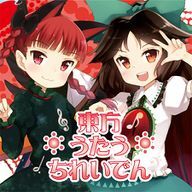 Touhou Singing Subterranean Animism (東方うたうちれいでん, Toho utau Chireiden) is a doujin album by IOSYS released on 2012-07-14. It features instrumental arrangements of themes from Lotus Land Story, Mystic Square, Embodiment of Scarlet Devil, Perfect Cherry Blossom, Immaterial and Missing Power, Imperishable Night, Phantasmagoria of Flower View, Mountain of Faith, Scarlet Weather Rhapsody, Subterranean Animism, Double Spoiler and Fairy Wars. It is the fifth IOSYS karaoke album, featuring off-vocal versions of previously released songs. The Ultimate Grilling Restaurant! Orin's Hell Mansion! original title: 死体旅行 ～ Be of good cheer! This page was last edited on 8 July 2017, at 17:01.